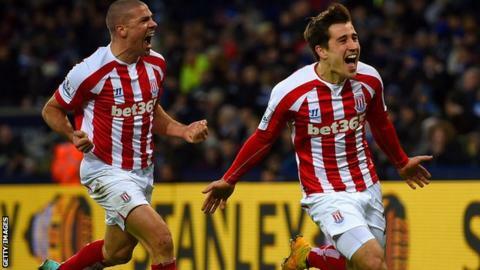 Bojan Krkic produced a brilliant finish for Stoke to end Leicester's chances of climbing off the bottom of the table for the first time in two months. The former Barcelona striker spun and shot left-footed past Ben Hamer from 16 yards to earn Stoke a fourth away win. Leicester boss Nigel Pearson surprised many by starting with £9m record signing Andrej Kramaric and eight-goal top scorer Leonardo Ulloa on the bench. Anthony Knockaert came close for the Foxes but Stoke had the better chances. It was an impressive response from Mark Hughes's side, who had been outplayed at Arsenal the previous week and were dealt a major blow before kick-off when skipper Ryan Shawcross failed a fitness test. The Potters captain had played in every league and cup game this season. Hughes, though, was able to select Victor Moses and Bojan in the same line-up. Moses, on loan from Chelsea, has been out with a thigh injury since November, during which time the 24-year-old Spaniard has emerged as Stoke's key attacking player. "If we can get them both firing at the same time, then we should be in good shape," Hughes had said before the game. And so it proved, with Moses constantly probing and Bojan illuminating a contest low on quality when, fed by Jonathan Walters with half an hour remaining, he turned and fired a low shot into the bottom corner for his fourth goal of the campaign. Jonathan Walters produced his third assist of the season. Only once (2011-12) has he provided more in a single Premier League campaign. No player has been involved in more Stoke goals than Walters this season (seven: four goals, three assists). It was a blow for Leicester, who had gone into the contest unbeaten in four matches and in good spirits, with club record £9m signing Kramaric given the go-ahead to play after being granted a work permit. But the Croat was left on the bench, along with the man he supplanted as the Foxes' record signing - Ulloa - as Pearson went with the pace of Jamie Vardy and David Nugent. Asmir Begovic saved smartly from Foxes defender Knockaert in a poor first half and Stoke's Philipp Wollscheid headed a corner wide. In the second half, Marko Arnautovic's shot wildly into the side netting after being put through by Moses and Steven Nzonzi's fierce volley was brilliantly saved by Hamer. But Bojan had been the stand-out player from the start and it was little surprise that it was he who provided the game's decisive moment. Pearson eventually introduced both Kramaric and Ulloa once behind, but Stoke were well organised and still looked the likelier team to score, substitute Peter Crouch coming close to doubling the lead with a spectacular late effort. While Stoke continue to head towards mid-table safety, Leicester remain bottom as they bid to become only the third team in Premier League history to stay up after propping up the division at Christmas. Leicester boss Nigel Pearson: "I am disappointed because of how other results have gone. It is a missed opportunity for us. The only piece of quality on the day won the game. "Stoke have Premier League know-how, there is no doubt about that. They are a big, powerful side, and we didn't find our own performance levels." On record signing Kramaric: "It is always difficult for players to make an impact when the side is not quite at its best, as was the case with us second half. But if he gets his chances he will put them away." Stoke boss Mark Hughes: "We were always a threat going forward, scored with a great goal, and didn't allow them to get any momentum against us going forward. "I wouldn't say we created chance after chance but there were passages of play in and around the box where we did well and the goal was a great goal. "When Bojan gets the ball in those areas of the pitch, you always sense something will happen." Match ends, Leicester City 0, Stoke City 1. Second Half ends, Leicester City 0, Stoke City 1. Attempt missed. Peter Crouch (Stoke City) right footed shot from long range on the right is close, but misses the top right corner. Corner, Stoke City. Conceded by Paul Konchesky. Corner, Stoke City. Conceded by Marcin Wasilewski. Jonathan Walters (Stoke City) wins a free kick in the defensive half. Substitution, Stoke City. Geoff Cameron replaces Victor Moses. Substitution, Stoke City. Peter Crouch replaces Marko Arnautovic. Corner, Leicester City. Conceded by Asmir Begovic. Attempt missed. Anthony Knockaert (Leicester City) right footed shot from the centre of the box is close, but misses to the right. Assisted by Daniel Drinkwater with a cross. Bojan (Stoke City) wins a free kick on the left wing. Foul by Tom Lawrence (Leicester City). Corner, Stoke City. Conceded by Andy King. Substitution, Leicester City. Tom Lawrence replaces Jeffrey Schlupp. Substitution, Leicester City. Leonardo Ulloa replaces David Nugent. Attempt saved. Andrej Kramaric (Leicester City) right footed shot from outside the box is saved in the centre of the goal. Assisted by Jeffrey Schlupp. Attempt missed. Philipp Wollscheid (Stoke City) header from the centre of the box misses to the right. Assisted by Phil Bardsley following a set piece situation. Substitution, Leicester City. Andrej Kramaric replaces Jamie Vardy. Hand ball by Anthony Knockaert (Leicester City). Goal! Leicester City 0, Stoke City 1. Bojan (Stoke City) left footed shot from the centre of the box to the bottom right corner. Assisted by Jonathan Walters. Attempt saved. Steven N'Zonzi (Stoke City) right footed shot from the centre of the box is saved in the top centre of the goal. Phil Bardsley (Stoke City) wins a free kick in the defensive half. Foul by Jeffrey Schlupp (Leicester City). Attempt blocked. Jonathan Walters (Stoke City) right footed shot from outside the box is blocked. Assisted by Victor Moses. Offside, Stoke City. Bojan tries a through ball, but Marko Arnautovic is caught offside. Foul by Marc Wilson (Stoke City). David Nugent (Leicester City) wins a free kick on the right wing. Asmir Begovic (Stoke City) wins a free kick in the defensive half. Foul by Marcin Wasilewski (Leicester City). Foul by Victor Moses (Stoke City). Anthony Knockaert (Leicester City) wins a free kick on the right wing. Attempt missed. Marc Wilson (Stoke City) right footed shot from outside the box is high and wide to the right. Assisted by Glenn Whelan. Attempt missed. Marko Arnautovic (Stoke City) right footed shot from a difficult angle on the right is close, but misses to the right. Assisted by Victor Moses.